Oh man, have I been away for a long time. Far too long (seven months). Lots of things have happened that needed my energy and my attention and blogging went to the background for a while. I've recently made them with "la famiglia", my little chosen family here in The Netherlands (if your real family is away you can always create a new one which includes your friends, their children, cats, dogs, rabbits and cavias, don't you think?) :D.
Recently Claudia, an Italian friend of mine and beloved member of la famiglia, promised to cook something typically Italian for her son's school to be sold for a benefit during their yearly Open Day celebration. 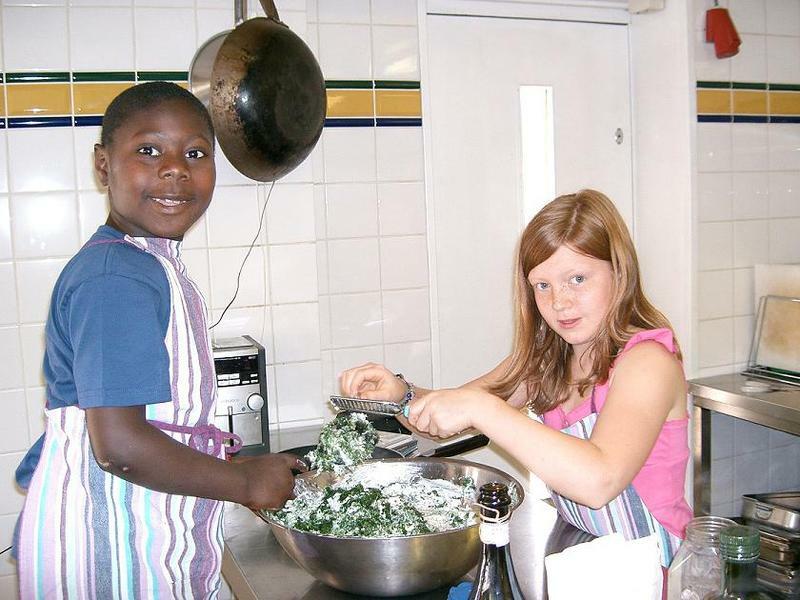 Mackenson goes to the most fabulous school that I know, the European School in Bergen, The Netherlands, where children from all over the world learn that dealing with different languages, religions, skin colours and cultures is a very positive and exciting experience. Since April 1st I have my very own professional kitchen (Kookstudio Oud-Zuid in Amsterdam) in which to give my cooking courses and prepare my caterings (finally a big space!) we decided to cook together - Mackenson, Camilla, Claudia, Simonetta and myself, and of course my little dog Mirtilla that came into the kitchen to check our work regularly - to prepare some lasagne vegetariane (vegetarian lasagna). Twenty medium-sized and six smaller trays, to be precise, that were sold during the Open Day on Sunday the 3rd of June. 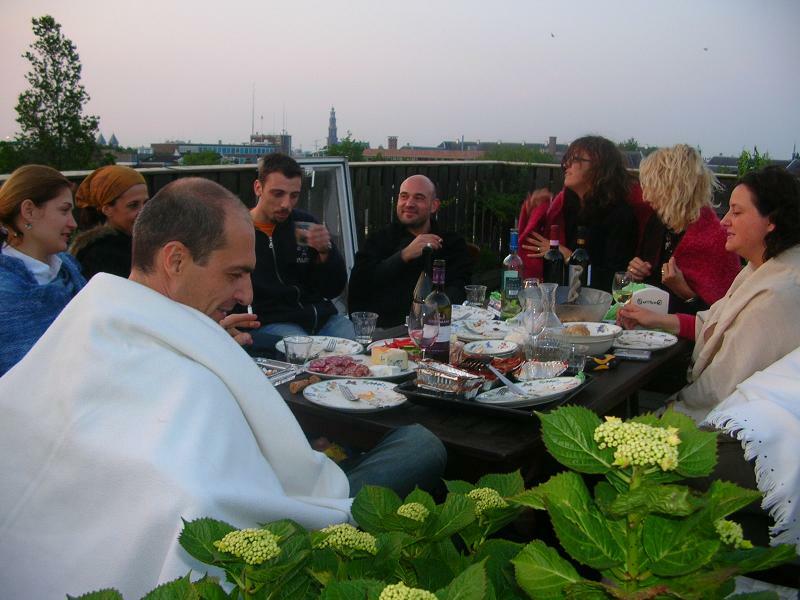 Ahum, not only sold, to be completely sincere, since we kept the smaller trays for ourselves and ate them on the evening of our cooking get-together at Simonetta's on her beautiful roof terrace with a view on the Amsterdam panorama (see pictures). A few more friends that received a last-minute invitation joined us and shared the pleasure. 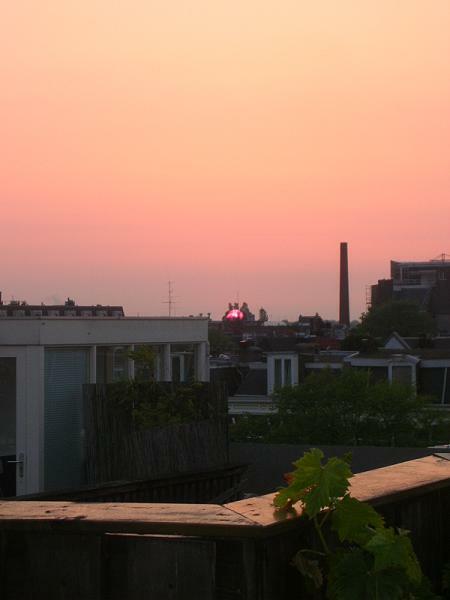 What a fabulous way to end a fantastic day: eating lasagne and lots of other great stuff with your friends while enjoying the beautiful sunset and sipping a nice glass of wine. First prepare the tomato sauce and the béchamel because they're quite labour-intensive and need time. For the tomato sauce: peel and finely chop the garlic. 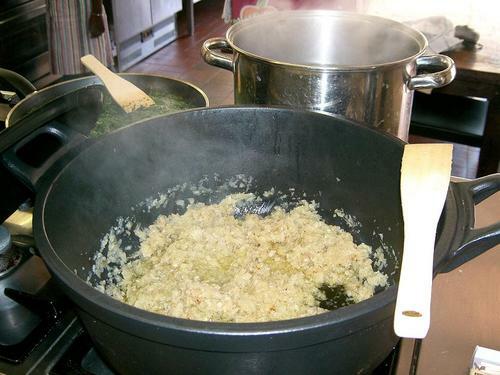 Fry it gently in with the chopped onions in 12 tablespoons of olive oil until soft and glazy. Add the sieved tomatoes and 5 dl/16.9 fl. oz. of water. Mix well. Bring the sauce to a boil and let it thicken for about 10 minutes on a low flame (longer if the passata isn't very thick and concentrated). Season with salt (optional if the passata is already salted). Remove from the flame and add the hand shredded basil leaves and some freshly ground black pepper. For the béchamel sauce: melt the butter in a pan, add the flour (through a fine sieve, to avoid lumps) and fry gently for about 1 minute. Add the milk (better if at room temperature) and slowly bring to a boil. Lower the flame and keep on mixing until the sauce gets a bit thicker (not too thick because béchamel, just like tomato sauce, has to be quite fluid so that the dry lasagna sheets have enough moisture to cook properly). Season with salt, pepper and some freshly grated nutmeg. Leave the béchamel to cool off a bit. 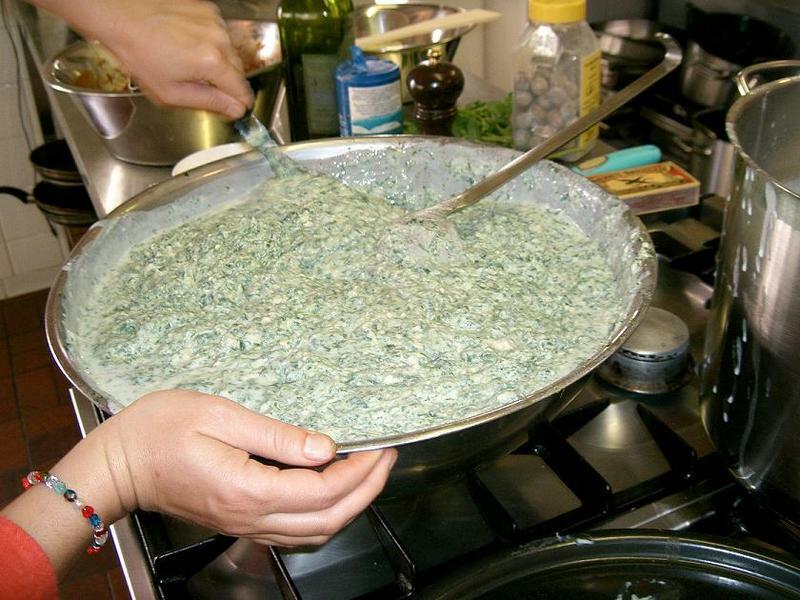 Prepare the filling mixing ricotta, spinach (first remove the excess water squeezing the cooked spinach very well), a pinch of salt, the grated Parmesan of Grana cheese, a pinch of ground nutmeg and some black pepper in a big bowl. Of course you can also use fresh leaves instead of frozen ones (preferably wild spinach), the only thing is that you need a lot more than 1 kg. (2,2 lb) fresh leaves to obtain the right amount of cooked greens (about 2/3rds more). Leave the filling to rest for a while and then mix half of it with the béchamel sauce. Put the other half aside. Pour enough tomato sauce in a big oven dish so that you abundantly cover its surface. 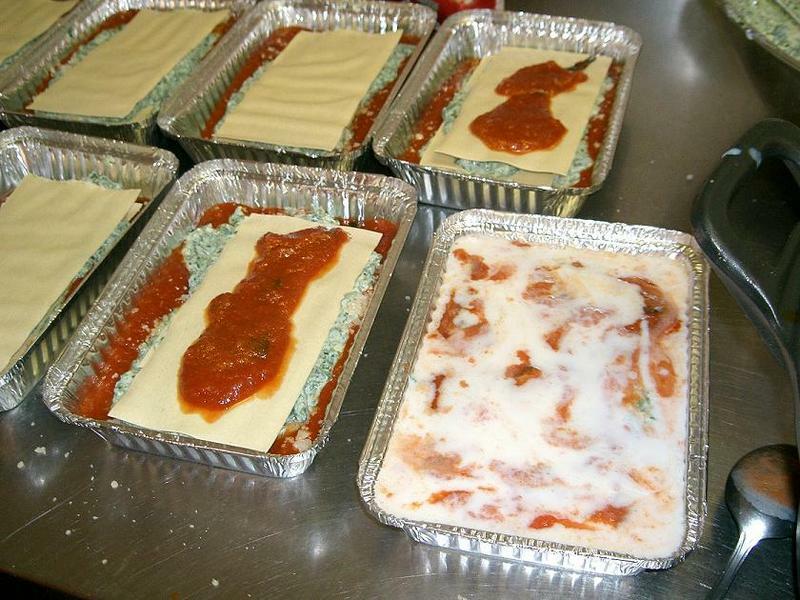 Lay enough lasagna sheets to cover the sauce - just one layer - and cover further with a good amount of ricotta-spinach filling. Sprinkle with grated cheese and lay one more layer of lasagna sheets over the filling. Cover with another layer of filling and some cheese. 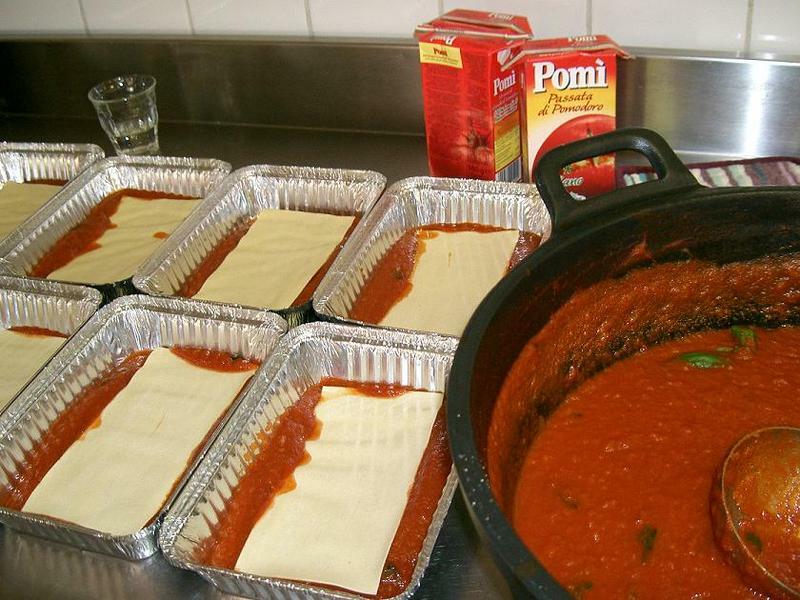 Make a last layer of pasta sheets, tomato sauce and béchamel. 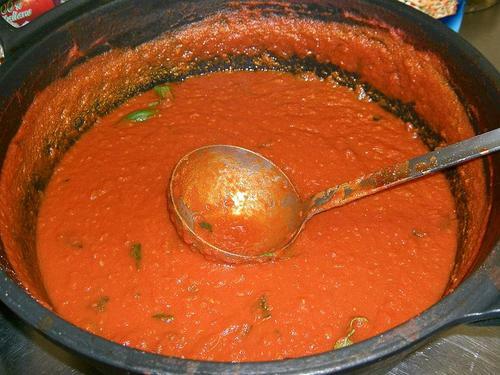 Let the two sauces mix with one another and complete the dish with some grated cheese on top. Put the oven dish in the pre-heated oven (180°C-356° F) for about 30 minutes or until the lasagne have a nice little crust. 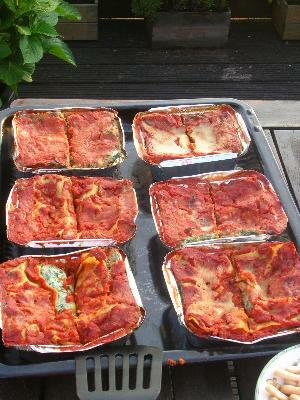 Serve the lasagne only after they've been out of the oven for a while so that they can become nice and compact and are not too hot and fluid. 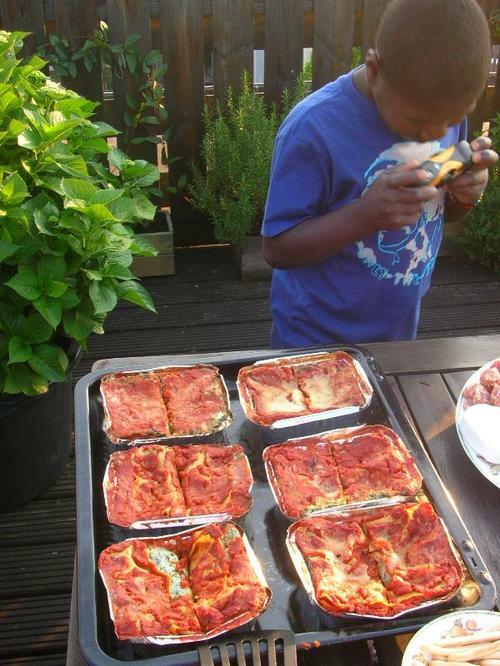 TIP: Lasagne taste even better if you make them one day in advance. You only need to warm them up very well before serving them! LINGUISTIC TIP: the singular "lasagna" indicates just one sheet of pasta, while the plural "lasagne" indicates the complete dish. Mixing the filling with some béchamel Filling the oven dishes... ...and some more filling.